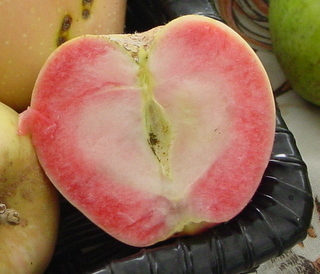 Winner of a 2004 All-America Selections Award, Sweet Beauty was judged superior in flavor and texture, as well as ease of growth and early maturity. The flavor is incomparable — sweet and crisp texture. Striped oblong fruits are the perfect size one generous or two average-sized servings. Sweet Beauty Watermelons may be available through September. This variety of pepper was originally from Basilicata, a southern region of Italy. 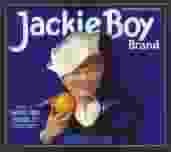 It takes its name from seed saver Jimmy Nardello, who brought the seeds from Italy while immigrating to Connecticut in 1887. This sweet pepper matures in 80-90 days from transplant, its fruits are 10-12” long and the plants can reach 24”. 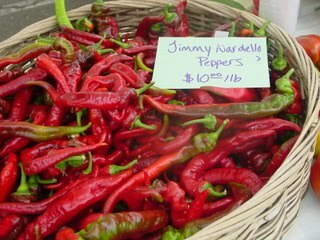 The Jimmy Nardello’s pepper is sweet and light when eaten raw. It is considered one of the very best frying peppers as its fruity raw flavor becomes perfectly creamy and soft when fried. To make matters worse, Pink Pearls are homely on the outside, with dull yellow-brown, faintly blushing skin and an uneven conical shape. I almost skipped over them at the farmers market myself. But they have a secret: inside, they’re positively vampy, with shockingly pink, sweet-tart flesh. Even the blooms are bright pink. The fruit is crisp and tastes of raspberries and lemon custard. In fact, I baked some Pink Pearls in a galette with raspberries and they were a natural pairing. Find the Pink Pearl at Triple T and Lamberts. 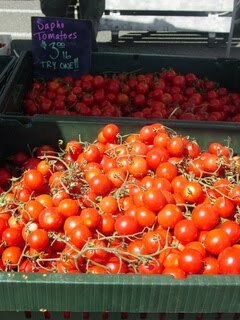 September 17, 2011 The market’s Tomato Festival – an opportunity to taste a wide variety of locally produced tomatoes. Find the perfect tomato for every dish. Chef’s demonstrations and activities for children. Pictured: Finally the tomatoes are in at the Patch. The Thursday morning market is located on Range (across from the Coddington Whole Foods.) This week Cafe Gaga joins the vendor line-up. Chef Elizabeth Eichhold shows how to use the tomatoes that have finally ripened. She is making gazpacho and you get a taste too! 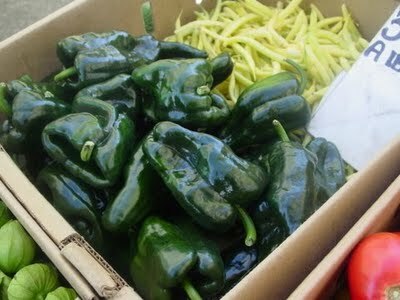 “I was thinking about this at the Santa Rosa farmers Market last Saturday when I spotted the first poblanos of the year, at Beet Generation’s stall. The moment is nearly as thrilling as when I finally find a perfect and perfectly delicious tomato. Nathan from First Light Farm has sweet corn. 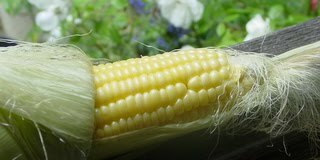 On Saturday he had bodacious (not bragging that’s the name) a hybrid yellow corn – the sweetness of white corn with the flavor of yellow. This coming Saturday he hopes to have brocade a hybrid white and yellow corn. 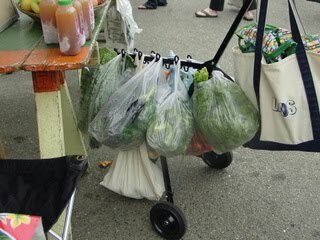 People are always on the look out for a better way to tote home their produce from the farmers market. And if stacking your produce has led to disaster, this cart looks like it might have potential. This shopper was buying apple juice from Mariapple Farm but wasn’t at all worried about it turning those lovely green into mush. 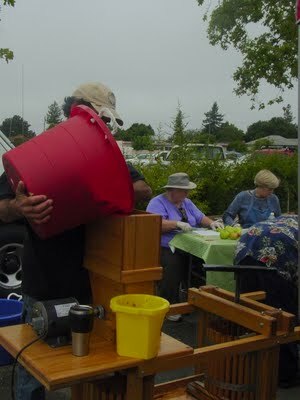 Join in the fun and get a real taste of Sonoma; fresh hand pressed Gravenstein juice and other apple treats. Eating local is a snap – just add Gravensteins to your menu. Can’t get anymore local then that. Western Sonoma County is the perfect climate for the Gravenstein apple and this year’s crop is just starting to appear at the market. Last Spring Acadia Publishing in conjunction with the Western Sonoma County Historical Society published Sebastopol’s Gravenstein Apple Industry. The over 200 photographs presented in this new book come from the Historical Society archives, particularly the William Borba collection, the Sonoma County Library and other community collections. Coauthors Frank Baumgardner, Evelyn McClure, Stacy Ruppert, and Rae Swanson all volunteer with the Western Sonoma County Historical Society (WSCHS) as archivists, docents, and historians. Their backgrounds are diverse, but they share a strong interest in preserving local history. 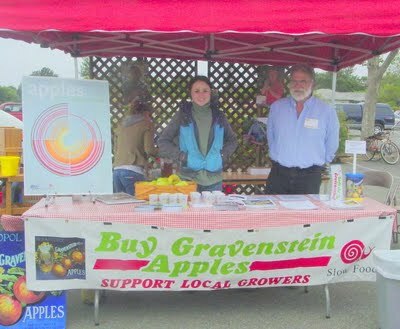 It’s not only a history of the apple industry but of community support for the gravenstein.